Nestled in the foothills of Northern San Diego County is the unique, environment-friendly designed, and master-planned community of Sabre Springs. It is one of the newer neighborhoods of San Diego, but has been established long enough for the landscaping to mature allowing for full grown trees and gorgeous surroundings. 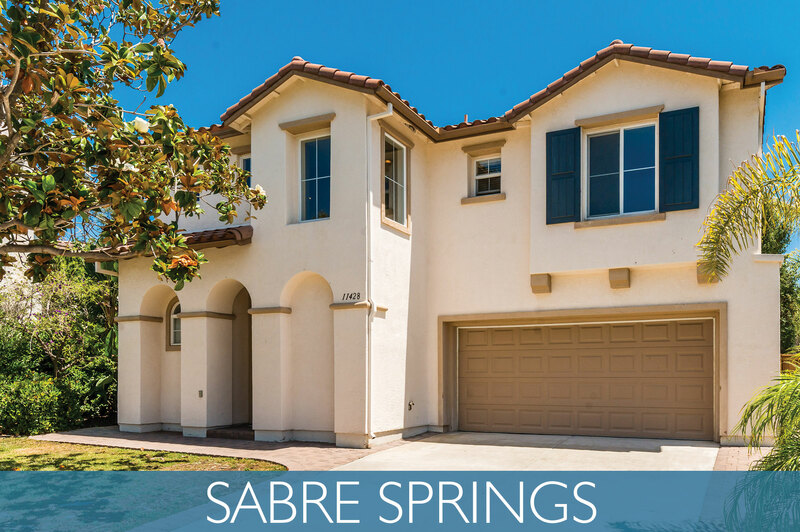 Located just 15 miles from the coast and 20 miles from Downtown San Diego, Sabre Springs homes share great views of the valleys and foothills in the country while still being near to all the modern amenities of San Diego. View more about Sabre Springs on Pinterest! The community of Sabre Springs spans over 1,500 acres and offers a blend of affordable homes, as well as luxurious and expansive single-family homes for sale. Subdivisions including Monticeto, North Creek, and Monterey provide smaller three and four bedroom homes for sale and larger properties with more space may be found in Sabre Highlands, Hillsborough, and Belle Fleur. Almost 800 acres of land in Sabre Springs have been preserved as open space offering residents a variety of nature trails for walking, running and biking. There are also a number of community parks in the area including Lake Miramar where residents can enjoy swimming, boating, fishing and picnicking and Los Peñasquitos Canyon Preserve which provides open space to enjoy nature in San Diego. The community of Sabre Springs provides ample recreational opportunities. The Sabre Springs Park has two Little League fields and the Sabre Springs/Carmel Mountain Ranch Recreation Center is equipped with indoor and outdoor basketball courts, softball fields and areas for relaxing picnics. For golf enthusiasts, there are numerous courses in the area including Rancho Los Pensaquitos Golf Course. Children living in Sabre Springs are served by the public schools in the award-winning Poway Unified School District, which has a reputation for excellence in education among the best schools in San Diego County.